With the mailing of the state registration this past week, several questions have come up regarding the elimination of the Best of Show program as it has been and the installation of two new recognition programs that replace the old state model. The All-Washington Critique and Award program: Replaces the old Best of Show format. Publication staffs (newspaper, newsmagazine, yearbook and website this first year, broadcast to come) will submit several issues, in the case of the newsmagazine/newspaper, or one, for yearbook and website, for critique by June 12. The publications would be evaluated by a judges, pulled from programs throughout the country, during the summer and returned to the Critique Coordinator by July 17. Based on their critique scores, publications could earn a Superior, Excellent or Honorable Mention. The publications earning a Superior are then eligible for the All-Washington designation based on another round of evaluations that happen in August. 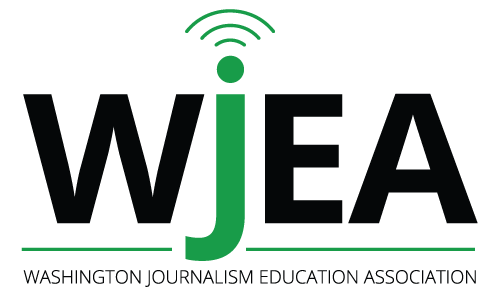 All award announcements will be made first at Journalism Day West in early September at the University of Washington. All-Washington winners earn a tangible plaque. Winners of the All-Washington have the potential for entrance in the State Hall of Fame after a certain amount of wins (still to be determined by the committee). This past summer a conversation started about the installation of a recognition program that would provide feedback and accolades for work produced throughout the year. The question that came up during the General Membership Meeting: what about the work produced in April, May and June? Isn’t that when most of the staffs produce their highest quality of work since they have had the entire year to develop skills? In a discussion about this, the idea for the All-Washington critique and awards program developed. As a state organization, it doesn’t make sense to have two awards program and the critique committee established to investigate and develop the program felt that the prestige of the new program would be the way to go. So what about the state conference? Is there still going to be a means of recognition for the journalism that staffs do? Absolutely! The second idea that developed through the development of the new award and dissolution of the old was the Best of Washington program (separate from the All-Washington). The Best of Washington is designed to recognize the work the staffs throughout the state have done in the last year in a variety of areas, from front-page design, page layout, photography, etc. The thought was to have staffs e-mail such work to the coordinator (in this case me, Sandra Coyer), I would then compile them and put them into a virtual publication housed on issuu.com for all programs throughout the state, and essentially the world, to view. My seniors are very upset because they feel that they do not get to celebrate their success with their staffs. What do I tell them? With any type of change there comes a certain level of discomfort as well as a range of emotions, such as anger, hurt, disappointment. But it also provides an extremely valuable teaching opportunity and learning experience. It is true that the seniors may not be able to be a part of the celebration for a job well done, that they feel as though they have been let down and consequently upset by something they have no control over. But this also is the opportunity for the seniors to define the type of leaders they want to be remembered for on their respective staffs. How they react and move forward will determine a lot about the legacy they leave behind. This change in the awards program does not diminish the work they have put into their publications but instead awards them for more than just one issue submitted for one contest. I would encourage staffs submitting for All-Washington to have a fall event that brings back their alumni and celebrates together (what a wonderful new tradition).